Finally!! Time to address my long due award nominations! 1.What would you do if you had ten million dollars/pounds/rupees etc? That’s a lot of money!! But yes, I have some crazy start up ideas but lack funds or investment. So, may be I’ll invest in setting up a start up business and create employment on a large scale. I would use the remaining to build good schools with accommodation for QUALITY living and education for the underprivileged in India or any place across the world. Emotional Understanding- This is of utmost priority to me, because no matter how intelligent/ attractive your partner is, lack of emotional connection will result in emptiness in a relationship. 4. What is religion(not god) according to you? Religion to me is Humanity. 5. Would you call yourself more analytical or creative, give reasons? 6. If you could change one aspect of your life overnight, but have to give up ten years of your life, would you do it and if, yes, then what would it be? Without any second thoughts, I would give up any number of years of my adult life to have my childhood back and remain a kid forever!! I wish something like this existed in real. Sigh! 7. Do you believe in the supernatural, magic, or however, you want to call it? Supernatural: I can think of this in two ways. I do believe in positive supernatural power, as the reason behind this very existence of the universe. As I never understood how matter can exist all by itself! While the other supernatural, say spirits/paranormal is a complicated area for me. As of now, I can say I do not believe in it. I do not understand coffee/ tea addiction, even though every other person I know is addicted to at least one. I don’t drink either! I have a habit of reading the ingredients, nutrition facts, or any other random stuff that is printed on the back of chips/chocolate packs. In fact any pack. I also make sure I read the piece of paper that is used to wrap a road side samosa/ other delicacies, before I throw it away. 9. How would you like to be perceived by others? It’s hard to pick one, as there might be too many. But when I first heard/ read about the World ending in 2012, I felt it was the funniest. Though I later started freaking out when I read few Nostradamus theories! 11.Do you like, doing these award nomination Q/A, why? I like doing these as I am an amateur in the blogging world, they are a source of encouragement. 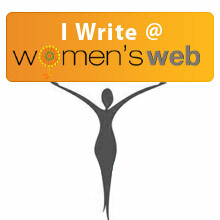 Award nominations help explore new blogs and throw a platform to know a little more about the writer behind the scenes. I know they are less than 11, but I was unsure of how many have less than 200 followers. Any budding blogger who comes across this can feel free to answer the questions. If there is something you would like to change about yourself, what would it be? Three random facts about you, that we don’t know already. If you had the power to change one aspect in the world today, what would it be and why? When you are not writing/blogging, what is the most likely thing we can find you doing? If you were to be stranded on an island and had a chance to take just one thing with you, what would it be? Congratulations on the award first and foremost. Your wonderful blog deserves more and more recognition. Reading some of your answers, I felt like it was me answering. They were so spot-on for me too — the answers for 2,4,6 and point no. 3 in 8. I regret to tell you this, but I don’t do award and chain posts. I apologize in advance if that hurt you. No problem at all! It’s perfectly fine! 🙂 I took this challenge, just to reveal a bit more about myself, as I did not disclose many details in my ‘About’ page. I love reading. As you said, maybe this is an extension of that, as also the curiosity. I pretty much enjoyed reading this. lot of insights about u as a person..
Hey! Thanks for nominating me! And hey be ready for a blog soon….!!!!!!!! This award shows how much value you bring to our blogging community. Congratulations and thank you for all your fine work. I know Marje and Konrad. I met you on Gary’s site. Thank you for liking my comment on his blog. I wanted to come over to thank you and introduce myself. I agree with the quote: No act of kindness however small is ever wasted. Don’t you? Thanks again for liking my comment. Thank you so very much for taking time to stop by my blog and comment! Means a lot to me 🙂 🙂 Yes, no act of kindness irrespective of how small it is, will be ever wasted. I’d love to! I accept the nomination:) Answers on the way and Thank you!!! Congratulations for the first award :). So I really enjoyed reading your answers :). Could see many things in common. Oh yeah, those are the list of places even I would love to visit.